We’d love your help. Let us know what’s wrong with this preview of The Lost Boys by Gina Perry. The fascinating true story of one of the most controversial psychological experiments of the modern era — a real-life Lord of the Flies. In 1954, a group of boys attended a remote summer camp where they were split into two groups, and encouraged to bully, harass, and demonise each other. The results would make history as one The fascinating true story of one of the most controversial psychological experiments of the modern era — a real-life Lord of the Flies. Conducted at the height of the Cold War, officially the experiment had a happy ending: the boys reconciled, and psychologist Muzafer Sherif demonstrated that while hatred and violence are powerful forces, so too are cooperation and harmony. Today it is proffered as proof that under the right conditions warring groups can make peace. Yet the true story of the experiments is far more complex, and more chilling. To ask other readers questions about The Lost Boys, please sign up. I must say how very well written this story is. I liked this story of how social psychology's studies the Robbers Cave experiment. Social psychologists Muzafer Sherif disguised himself as the camp care taker taking down notes on eleven year old boys being brutal to each other. A group of boys attend a remote summer camp, they were split into two groups and made to bully any harass each other. During a fight a boy named Red produced a knife with them having to be pulled apart. A fascinating and finely written study of one of the best-known social experiments of the twentieth century. Through archive research and interviews with participants, Gina Perry uses her investigative flair to reconstruct the context, characters, and stakes of this strange piece of history. Darian Leader, Author of What Is Madness? When the first punch is thrown in the opening chapter, you know you’re in for a wild ride. In The Lost Boys, academic sleuth Gina Perry investigates the back story of A fascinating and finely written study of one of the best-known social experiments of the twentieth century. Through archive research and interviews with participants, Gina Perry uses her investigative flair to reconstruct the context, characters, and stakes of this strange piece of history. When the first punch is thrown in the opening chapter, you know you’re in for a wild ride. 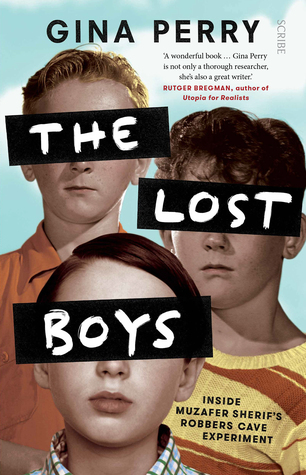 In The Lost Boys, academic sleuth Gina Perry investigates the back story of a real-life Lord of the Flies study of human behaviour at a summer camp. The fascinating journey — which takes us through the history of psychology, Turkey, and even American summer camps — reads more like a detective novel than a psychological history book. In The Lost Boys, Gina Perry has created a meticulously-researched, skilfully crafted account of a decades-old experiment that still casts a shadow over the lives of its subjects. This is a fascinating, disturbing and utterly compelling cautionary tale about the dangers of scientific obsession. Intriguing… Written in an engaging style, it will fascinate both academics and casual readers alike. [An] excellent piece of non-fiction interrogating one of the most celebrated pieces of psychological research of the mid-20th century. An engrossing expose of the Robbers Cave experiment, a classic study in social psychology, was also a fine historical recreation. A clear-eyed assessment of a significant chapter in the history of psychology and social science. Perry writes about Sherif’s complicated past, why he was able to carry out the test, and how the boys banded against each other at the camp. But she also digs into the theory behind it, which feels spookily relevant now: the idea that we easily pick sides based on arbitrary circumstances, and that can lead to violence. [Perry’s] analysis of Sherif’s scientific process benefits from a distance, seeing revelations that Sherif and his staff were too close to see. It was enthralling and appalling at the same time. This is an intriguing and highly critical look at Muzafer Sherif's experiments into social cohesion. It's well researched, and engagingly written. Where it fell down for me was that Sherif's experiments weren't actually that engaging, due to being pretty crap. The second half of the book, which follows Sherif's life, is the section which has stayed with me. Perry has provided a strong debunking of the Sherif myth that he showed something significant. She deconstructs how he created a scripted sce This is an intriguing and highly critical look at Muzafer Sherif's experiments into social cohesion. It's well researched, and engagingly written. Where it fell down for me was that Sherif's experiments weren't actually that engaging, due to being pretty crap. The second half of the book, which follows Sherif's life, is the section which has stayed with me. Perry has provided a strong debunking of the Sherif myth that he showed something significant. She deconstructs how he created a scripted scenario for his experiments, manipulating events to unfold just as planned. Sherif believes that boys divided into competitive groups will develop violent antagonism, which can then be resolved in they all face a common threat, and sets up a summer camp to prove it. Frustratingly to him, this isn't always successful as the boys don't follow the antagonistic script easily, but rather than learn from how they do behave, the experimenters simply scramble to get the whole thing "back on track", by vandalising equipment, rigging the score and flat out agitating in conversation. The irony, as Perry points out, is that the study into how groups develop dynamics ignores the dominant division in the camps between staff and the boys, and fails to look at how the boys respond to the irresponsible and unpredictable behaviour of the adults. Perry also strips back the ethical failures here - worst in not getting anything remotely resembling informed consent - and the lack of follow up to ensure the boys are ok. Many of the boys she tracks down were still unaware - 50 years later - that the camp was an experiment. There is a certain pleasure in reading about how the boys thwart the experiment, both by maintaining strong empathy with each other, and by working out the adults are losing the plot. But in the end, this is just too staged to provide insight into much. The scholarship is this section is outstanding, and Perry goes a long way to a deserved tarnishing of the reputation of a study still cited more than, apparently, it should be. But as a tale it fell a little flat. After World War II there was tremendous urgency around finding explanations for what happened in Germany. How could a modern society lose itself in hate and violence, committing genocide on a scale and efficiency unimagined before? One of those who attempted to answer that question was Muzafer Sherif. To do so, he endeavored to explore how a group forms cohesion and comes to oppose and even hate another group and discover if they could be brought back together. It all sounds so noble until you r After World War II there was tremendous urgency around finding explanations for what happened in Germany. How could a modern society lose itself in hate and violence, committing genocide on a scale and efficiency unimagined before? One of those who attempted to answer that question was Muzafer Sherif. To do so, he endeavored to explore how a group forms cohesion and comes to oppose and even hate another group and discover if they could be brought back together. It all sounds so noble until you realize the group he is experimenting on are twelve-year-old boys, isolating them at summer camps where his counselors incited competition and rivalry to create division. This is all explored in great detail in Gina Perry’s The Lost Boys. The history of medicine and psychology is full of experiments that baffle a modern person, wondering how was this allowed to happen, but then I wonder what we are allowing to happen now. I can understand the importance of understanding how we form distinct groups and how in-group and out-group rivalries can lead us to strategies to make a more cooperative and kinder world. Perry does an excellent job of rooting Sherif’s passion for exploring this in his past experience in the volatile history of Turkey during the dissolution of the Ottoman Empire and the rise of Ataturk. The experiments are recounted in fascinating detail, drawing from recordings and notes from the experiments. Hidden microphones captured so much more. The assistants who functioned as camp staff wrote detailed daily reports that revealed far more than they may have realized as they described the same situations very differently. Perry is painstaking in demonstrating that perhaps the real experiment should have been the process of the counselors forming groups and clashing and coming together. The experiments took place with two groups of children, the final one at Robbers Cave in Oklahoma which give them their name, The Robbers Cave Experiment. The Lost Boys is an extraordinary book. Perry has access to audio recordings of the experiment, reports, and the writings of Sherif to go through to create a history of extraordinary immediacy. Her analysis of Sherif’s scientific process benefits from a distance, seeing revelations that Sherif and his staff were too close to see. It was enthralling and appalling at the same time. I thought Perry’s exploration of his youth in Turkey was weaker, in part because she seemed too diffident about what happened in Turkey. She describes the expulsion of the Armenians and honestly reports they were marched into the desert and killed, but doesn’t use the word genocide. It was a weakness that asserted itself in Turkey where she was reluctant to ask questions about Sherif for fear of offending the government. However, other than that, I thought the book was excellent. I received a review copy of The Lost Boys from the publisher. It will be released on April 2nd. This book is a well researched account and discussion of some experiments undertaken in the early 1950s in America by a social psychologist called Muzafer Sherif. The first part looks at an initial experiment, where 24 boys previously unknown to each other were brought together for a summer camp type experience. The group bonded, then separated and came back together again, so the researchers could look at conflict and peace keeping as well as the social relations within groups, herd mentality a This book is a well researched account and discussion of some experiments undertaken in the early 1950s in America by a social psychologist called Muzafer Sherif. The first part looks at an initial experiment, where 24 boys previously unknown to each other were brought together for a summer camp type experience. The group bonded, then separated and came back together again, so the researchers could look at conflict and peace keeping as well as the social relations within groups, herd mentality and social pressure. Then the second part goes into the main experiment at Robbers Cave, largely built on ideas and developments from the first study, but more deliberately engineered to bring out group rivalry and conflict. Finally the research is put into context and we learn of Sherif’s personal history and development from a childhood in changing Turkey lead to his interests in these ideas and how his life in the worst part of the Cold War in America allow him to devise the theories he did, as well as a discussion of the implications of the study for other groups and wider society. Largely hidden from the sociological literature today, on his death the family donated his research to the archives of the university Gina Parry was working in, culminating in her dedicating herself to this book. My background is in social science and it wasn’t something I remember on my course, despite its cultural links and comparisons to Lord of the Flies and Stanley Milgram. Milgram's obedience experiments are widely criticised for the dubious ethics and deception of the participants which is also a feature of the Muzafer studies, in the way that boys were recruited and studied without consent from them or their parents, where there was a manipulation of situations to encourage conflict that could potentially put them in physical danger and psychological harm. These aspects of the book were the most interesting for me, especially in understanding where social psychology was at these times and how it has changed, especially as the discussion isn’t too dense and are enjoyable for the newcomer to the ideas rather than seeming academic and overly complex, it would also suit someone who wanted it for these purposes as the account and references are thorough. Overall I found these studies painted a positive picture of human groups, and remind us that while fighting, war and conflict are deep rooted in humanity, just as important are group bonds, being a good sport and pulling together. My criticism would be the focus of the study – boys only, in a new environment, of a certain age and characteristics for only a few weeks mean it wouldn’t translate well into looking at wider society, I was glad Gina Perry brought these studies to light for me and retold them with accuracy and in a readable form. Very complete research about Muzafer Sherif famous experiment. - An investigation into the youth and later years of Muzafer Sherif life. Part 1 is an interesting introduction. Part 2 and 3 are really interesting and are the core of the book. Really interesting to see how the experiments were designed, executed, and certainly (unconsciously?) biased. Part 4 got me Very complete research about Muzafer Sherif famous experiment. Part 4 got me bored, as I was not interested in Sherif's character. But you can't deny the research work that as been done by Gina. 4 stars for the first parts. Found Perry's previous book on the Milgrim experiment so engaging when I picked it up to look at in a bookshop I hardly noticed I'd read 20pages of it before I remembered where I was. Found this book more difficult to begin but once the story of the different experiments began I was once again enthralled. However when looking into the background of the psychologist my interest waned for several chapters until close to the end when examining his psyche around the time of his research. She humanise Found Perry's previous book on the Milgrim experiment so engaging when I picked it up to look at in a bookshop I hardly noticed I'd read 20pages of it before I remembered where I was. She humanises those involved in the experiment while still presenting both sides of the story. Gina Perry once again offers an engrossing insight into one of the most famous social psychology experiments of all time. Outlining the boys' camp studies, the experience of the boys, and the life of Muzafer Sherif, she situates the experiments in the context of Sherif's life where they take on new significance. An interesting look at the psychosocial experimentation undertaken on young American boys in the early 1950s by Muzafer Sherif and a group of his graduate students. Gina Perry has produced an extremely well researched and thoroughly readable book.